My wife does not need another edge. Enough already, TaylorMade. You realize that these ladies make their way into our foursomes, tee up yards ahead of us, have no crazy-angry-over-the-top ego that makes them swing too hard, and put it down the middle every time? You know this, right? 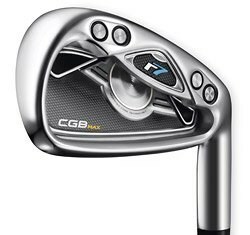 So take your special irons that boast the largest clubface of any TaylorMade iron. Take your tungsten weights to increase MOI and stability. Take your tour-proven Inverted Cone Technology for more forgiving hits and put it into something that helps the men. Take that technology and make it so my partner doesn't fight to keep a straight face when I thump a six-inch-deep divot. Take that technology and make it impossible for me to force me to stop making claims about my game that get dashed to the ground when I worm-burn a shot. The ladies don't need clubs that make them go farther down the middle. We need clubs that sense where the trees are, and automatically hit the ball the other way. Check that. My wife just texted me. She needs new clubs, and if I don't get TaylorMades, I eat tuna casserole for the next six days straight. Where can I buy these?